Scappoose's offense didn't have the ball a lot on Friday night at Cleveland High. Didn't need to. The Indians scored quickly and offense as they wrapped up their first regular season in the new Class 5A Special District 1 with a 50-21 victory over the Warriors. Scappoose will play host to La Salle Prep in the league's playoff round on Friday, Oct. 26. That game will help place both teams into the 16-team Oregon School Activities Association 5A playoff field, which is based on OSAA ranking. The Indians (6-2 overall, 5-1 in league) dropped one spot to No. 6 in 5A, despite winning on Friday, as Cleveland (1-7, 0-6) is No. 35 out of 36 teams. It was a good, if not great, performance by Scappoose, and that was good enough. "It was pretty good overall. It's always good when you win," Indians junior quarterback Jakobi Kessi said. "But we have some things to fix." Scappoose didn't score the first time its offense had the ball on Friday. But the Indians got touchdowns the six other times their first-string offense took the field — three times in each half. And, for good measure, senior Connor McNabb returned the second-half kickoff 80 yards for a touchdown. "We didn't score on that first drive and had a chip on our shoulder the rest of the game," Kessi said. The Indians never trailed and never were in trouble. But Cleveland kept things close for all but the final seconds of the first half, using a clock-eating ground game and not snapping the ball until the final second. The Warriors got a 6-yard TD pass from sophomore quarterback Logan Geiszler to senior wideout AB Osman with 34.1 seconds left in the half that pulled them to within 14-7. The Indians then took to the air and went 76 yards in five plays, scoring on Kessi's 7-yard run 2.5 seconds before halftime. "We needed that," Scappoose coach Sean McNabb said. "We weren't in a very good rhythm prior to that. "We work on that (two minute-type drill) a lot, so it was nice to get in that situation and good to be able to execute it. Jakobi made some really good throws on that series, and Gavin (Larson) and Connor made great catches." After intermission, Cleveland tried to kick off along the ground, but the boot unwisely went straight to McNabb and bounced perfectly into his arms. He went all but untouched on his way to the end zone, and a fake PAT/two-point conversion run by Matt Roth put the Indians on top, 29-7. "It was a good bounce," Connor McNabb said. "Our up front did a great job making a big gap up the middle. After that, you just run as fast as you can and see if you can get there." Cleveland got the next score on a 29-yard pass from Geiszler to junior wide receiver Demarkasay Davis. The duo also teamed up for a 66-yard touchdown pass that produced the game's final points with 4:16 left. Scappoose kept its starters in the game until running back Quincy Cleveland slammed into the end zone from 5 yards with 6:06 to go for a 50-13 advantage. The Indians finished with 193 yards rushing on 29 attempts, plus 221 yards passing. Second-string QB Luke McNabb, a freshman, hit a slant pass to 6-6 wideout Larson that went for 70 yards and a touchdown early in the fourth quarter. Kessi was a two-way threat. He read the defense well on two touchdown runs, one coming from 18 yards late in the third quarter. Kessi also opened the scoring with a 2-yard touchdown pass to junior wide receiver Colton Frates on the final play of the first quarter. "It was a bubble screen, and Connor was out there blocking for me," Frates said. "It was a great play call by the coaches. I walked right in." Cleveland totaled 149 yards rushing on 40 attempts. The Warriors also compiled 195 yards through the air, with Geiszler completing 8 of 14 passes. The Warriors' ball-control approach had more offensive plays than the Indians, 25-24, in the first half. "That's what you do when you're playing a team that's explosive offensively — the goal is to limit their plays," Coach McNabb said. "That was a good strategy on their part." But it never took long for the Indians to get their touchdowns. The first Scappoose drive lasted 11 plays, covering 56 yards. But after that, the Indians went 66 yards in four plays, 76 yards in five plays (at the end of the half), 54 yards in six plays, 70 yards in one play (the TD reception by Larson), and 43 yards in five plays. "We played a lot better in the second half," Coach McNabb said. Scappoose's quick end-of-half scoring drive included passes of 32 yards from Kessi to Larson and 37 yards from Kessi to McNabb. The Indians' final TD came after three consecutive penalties (two holding calls and a personal foul) had pushed Scappoose back from a first-and-10 at the Warriors' 13 to a first-and-52 at the Indians' 45. A swing pass from Kessi to McNabb went for 39 yards and got Scappoose back into the red zone. Cleveland came into the game with its only victory over winless Portland Interscholastic League foe Benson. The Warriors have had some close defeats this year (in overtime to Franklin, by one point to Wilson, by seven points to Hillsboro), but they also lost 49-7 to Wilsonville, 35-0 at Forest Grove and 48-0 at St. Helens. "They had nothing to lose, and we knew they were going to come out and play us hard," Coach McNabb said of the Warriors. "They had some big boys up front, but I thought we tired them out a little bit, too, which helped." 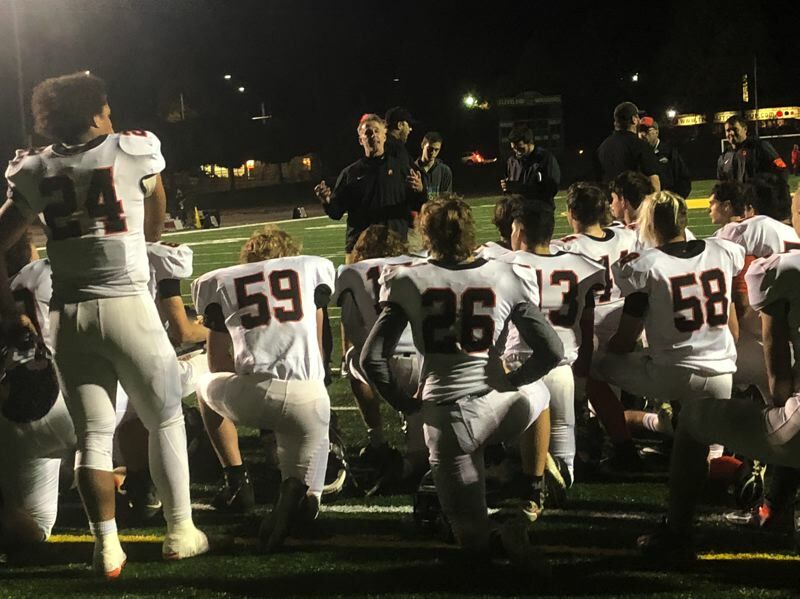 The Indians were visiting Portland for the second week in a row, and Friday's result was similar to that of Oct. 11, when Scappoose won 49-21 at Wilson. Now the Indians, who finished second to Wilsonville in the West Division, will prep for La Salle Prep, the No. 2 team in the East Division. The Falcons (6-2 overall, 5-1 league) nailed down that spot by outscoring Parkrose 13-0 in the second half for a 27-14 victory at home on Friday.